When the sun turns blue and the river turns green then there's an unusual indication that evil has assumed a seat once occupied by those considered to be of good will and conscience. The regrettable attempts by Intersociety, an organization once held in high esteem, is an eloquent testimony of the level of corruption and decadence that has inflicted the Nigerian Nation. The recent fallacious rumours peddled by InterSociety against the leader of the Indigenous People of Biafra, Mazi Nnamdi Kanu by alleging that he received a cash gift of $50,000 and a car from Willie Obiano is nothing but a concocted sham deliberately designed to tarnish and rubbish the image of a man who has been offered several Oil wells amongst other mouth watering promises, yet he rejected all for a course he believes in. Is it not funny to accuse someone who rejected Billions of Dollars to now stoop to the level of a murderer to receive peanuts from a man who orchestrated the murder of innocent IPOB protesters in Anambra with impunity. 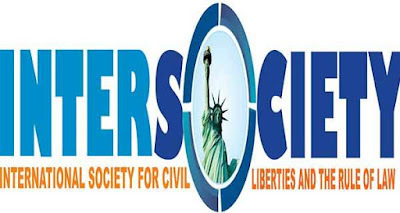 It is obvious that Emeka Umeagbalasi Esq of Intersociety who is a staunch supporter of Peter Obi and his group must have been handsomely paid to blackmail Mazi Nnamdi Kanu as indicated in their publication dated June 2, 2017 which is malicious and totally baseless. Could it be a game of jealousy or financial inducement? Whatever the game plan is,the truth is glaring at our face that Mazi Nnamdi has never related with Nigerian politicians and will not suddenly make a u-turn at this very critical moment of the struggle. Anyone that truly knows Mazi Nnamdi Kanu can authoritatively tell you that he is a man of his word and never shifts ground Grounds on his resolve especially on the Biafra restoration project. Common sense should have told the these paid enemies of progress and haters of good that if the issue is accepting gift in return for favours, Kanu shouldn't have publicly announced that there will be no elections in Anambra State? This is a clear case of character assassination and the perpetrators must know that an attack on Nnamdi Kanu is an attack on Biafrans in general. Na waoo, I still find it difficult to believe that The Intersociety that was at the vanguard of the defense of the IPOB's as against the harassment from the Nigeria's law enforcement agents. Don't forget this remains the same fantastically corrupt zoo nigeria but thank Chukwu Okike Abiama that our Messiah Mazi Nnamdi Kanu is whiter than snow.